A brand new litter of baby bunnies can be an exciting addition to your family. If you have never cared for a nursing mother and her offspring before, you may be concerned that your baby bunnies are not getting enough to eat. The good news is that it is fairly easy to tell if your mother bunny is taking adequate care of her babies. If you believe that your female bunny might be pregnant or she has just given birth, you need to learn absolutely everything you can about rabbit pregnancy, the birthing process and the care newborn bunnies need. Talk to your veterinarian and ask him to provide you with a few good sources of information so that you can familiarize yourself with the needs of your new family. The more you learn about your bunny and her babies, the more likely it is that you will be able to spot a problem if it arises. Mother rabbits are fairly slow to get their milk in, so you should not be alarmed if it is 24 hours or so before your mother rabbit feeds her babies for the first time. Do not take the babies away from the mother just because her milk is a bit late coming in; their suckling will help stimulate her milk production. Bunnies who are producing adequate milk will still only feed the babies once or twice a day, so don't be alarmed just because you haven't seen your mother bunny feeding the babies. When your mother bunny feeds her babies, she will stand on all four legs with the babies suckling beneath her. Feeding time should last approximately 10 minutes. 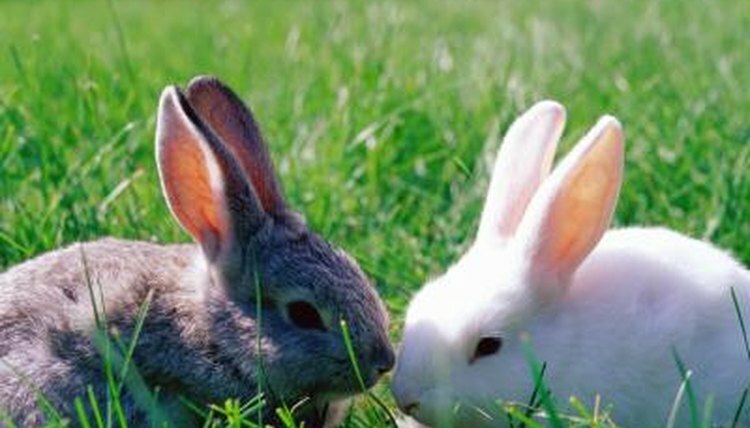 Baby bunnies who are being adequately nursed will appear smooth-skinned rather than wrinkly. Their stomachs should be larger than their heads and they should feel warm to the touch when you pick them up. If you turn the babies over, you should be able to see the white milk in their stomachs through their translucent skin. Babies should be squirmy and active when you pick them up. If you pick up a baby soon after nursing, you may notice milk or the dried remains of milk still stuck on the nose. Baby bunnies who are not getting enough to eat will have a wrinkled appearance, may be cold or cool to the touch, may cry frequently, will lack energy and may appear to have flat stomachs. If your baby bunnies are not being fed adequately, call your veterinarian for detailed instructions about how to take over feeding the babies with formula. Best Little Rabbit and Rodent House: Rabbit F.A.Q.